It is no surprise that everyone from long-time residents in Pauls Valley to new neighbors on the block are tired of dealing with the same-old overbearing dealership associates and desire to go through the process of purchasing a new or pre-owned Ford feeling like they are being heard and treated as a priority. Thankfully, Seth Wadley Ford of Pauls Valley provides you with the unparalleled level of customer service you deserve in an effort to surpass even the highest expectations. Achieving these audacious claims begins with carrying the largest selection of Ford cars, trucks, and sport utility vehicles (SUVs) in the Pauls Valley, OK area. Ranging from a full lineup of heavy-duty Ford trucks to numerous top-quality used vehicles, Seth Wadley Ford of Pauls Valley offers the automobiles you are interested in buying. Equally as importantly, our client-focused team is dedicated to ensuring your visit here is better than you ever expected from the first step to the last. Simply put, this means our automotive professionals let you stay in control of your car buying choices and provide any extra details or industry advice you need to select the most suitable vehicle for your everyday routine. If you like the sound of that (which we are sure you do), then call Seth Wadley Ford of Pauls Valley at (877) 710-2709 to start the hunt for your next automobile on the right trail. 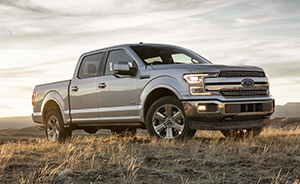 Ford is well-known for its trucks, and the F-150 sits at the top of the mountain with all other truck manufacturers looking to match it. With so many models and configurations, there is no doubt why the F-150 is the best-selling truck on the road today. If you are looking to buy your truck for work or simply comfort, we have a Ford F-150 to fit your needs. No matter what F-150 you test drive, you will experience a smooth and quiet ride, just as if you are driving a luxury vehicle. A step up from the popular F-150, the F-250 Super Duty truck has more power and towing capacity with additional room for some versions. You can choose the standard V8 engine or the optional V8 turbo diesel for increased towing capabilities. The Ford F-250 is not just a work truck; the Lariat, King Ranch, and Platinum F-250 trucks combine luxury and power. Whatever F-250 Super Duty truck you pick, you will be totally happy with the results. The F-350 Super Duty series of trucks for sale features best-in-class maximum towing and the ability to haul just about anything you need. 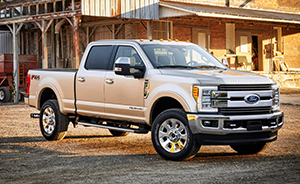 For years, the Super Duty has set the benchmark for heavy-duty pickup trucks that others can only try and follow. 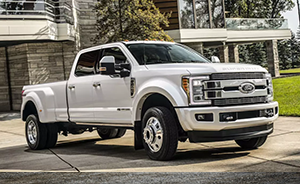 The new Ford F-350 Super Duty truck has improved power and suspension, increasing towing capacity and allowing you to get work done easier with no worries. Whether you choose a gas or diesel engine, both are very durable and run efficiently at low RPMs. While it is safe to say you already know these are only a few of the Ford models to find in Pauls Valley, OK, they represent the type of industry-leading options available at Seth Wadley Ford of Pauls Valley. Pencil in a convenient day and time to come see the automobiles featured in our showroom and speak with our Ford experts. Instead of daydreaming about sitting in the driver’s seat of your eye-catching new Ford, turn your wishful thinking into a done deal with our huge inventory and affordable prices. Now is the time to pull the trigger on purchasing the car, truck, or SUV you have in sight and proudly display it in your driveway. Although you might still have some apprehensions, we are only one of the many companies who deem Ford as the preferred automobile brand for discerning buyers. The foremost industry organizations and prominent players listed below have bestowed Ford with a multitude of recognitions and honors to reinforce them as the frontrunner in the automotive sector. With you now caught up on what makes Ford stand out above the rest, we want to reiterate that Seth Wadley Ford of Pauls Valley is your top destination in Pauls Valley, OK for the latest cars, trucks, and SUVs at prices you will not mind putting your signature on in the end. Give us a call at (877) 710-2709 the next free moment you have to spare. Our friendly staff is easy to talk to and ready to share with you all of the amazing features Ford integrates for unmatched driving.